This year’s Star Wars: Force for Change campaign was a resounding success, thanks in no small part to fans who were able to contribute to the initiative that works to benefit children through UNICEF and Starlight Children’s Foundation. 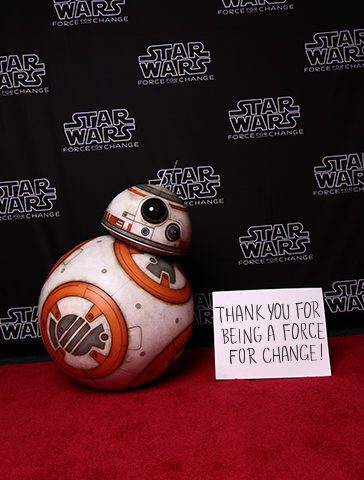 Thank you to all the fans who participated in the Star Wars: Force for Change 40thanniversary fundraising campaign. Over the course of four weeks between April 11 and May 11, 2017, over 66,435 people from over 160 countries entered for their chance to win three once-in-a-lifetime Star Wars experiences. In the end, we were able to raise a gross total of over $3,400,000, with net proceeds benefiting UNICEF and Starlight Children’s Foundation! With the funds we raised, UNICEF and Starlight Children’s Foundation are able to provide much-needed support for children around the world.